The Raptor 90 3D is a step forward in Thunder Tiger’s quest to regain the lead in R/C helis. they have taken the 90 SE and removed parts and changed others for lighter ones to get a lower weight with more rigidity and a helicopter more akin to that wanted by today’s 3D fliers. Colin McGinn puts it through its paces. There will be those that say this latest Raptor is still too heavy, but it’s a bullet proof machine. Of all the RC helis I’ve had, I know I can fly the crap out of a Raptor 50 on a Saturday, go back to the field and do the same on Sunday, and with only a safety check over the machine, do the same the next weekend. Raptors hold because of their longevity and have a special place in my heart and workshop. I have so little time available nowadays that I can’t afford to have a machine that explodes in the sky, or you can’t get parts for from any shop. Yes big statements to make at the start of a review, but it is based on the proceeding knowledge of the Thunder Tiger range. I was looking for a 90 machine to replace one I had lost confidence in and was delighted when offered a new 90 3D to see if I liked the 90 as much as I liked the small TT helis. As always with Thunder Tiger the packaging is eye catching for the retailer’s point of view, but are 3D aficionados interested in box art? Nope, but it does mean the manufacturer loves the product enough to spend some time on it! Inside the box you find the bits dominated by the plastic canopy, still to this day I wish they would cut them out on a machine, but the resulting dish that you cut off is useful when doing the building so cut that bit first! There are then two main boxes containing the relevant parts in sequential bags. That said not all the parts are in the correct bag for the sequence, that being so, we must remember that it is highly unlikely for this to be the first build ever undertaken by someone, but I’m sure TT could tidy it up a bit in this area. It would be silly to do a step-by-step build as this heli is not aimed at the beginner, however, with that said I can see no reason why with careful reading and checking of the assembly steps a beginner couldn’t build this kit without any experience. The sequence is pretty standard with the main frame being built up with its sub-assemblies, including elevator control, pinion/clutch fan and fuel tank. Two points worthy of note is that it’s good to install extra foam around the fuel tank if you intend to run a pumped pressure system as the tank will swell and rub the frames. The fan must be tapped or the optional fan purchased for the YS engine. My choice was to try the 90 YS long stroke pumped, a new engine that I witnessed in another pilot’s heli that gave huge and smooth power, added to a Hattori pipe. That little power package should haul the Rappy 90 around the skies easily. While on the subject, you have to install the magnets for your chosen governor. I chose a Futaba GV1 as these have been consistent over a number of years and I think they’ve now reached the point of ‘if it ain’t broke don’t fix it’. All the steps in section one leave you with sub-assemblies allowing you to have breaks, and helping you to get each bit right before mating them with each other. While making one of these sub assemblies, I remembered a comment from my friend Peter Navotny, an ex-Thunder Tiger pilot who suggested cutting and fitting small rings of heat shrink over the pins on the tail drive to stop them coming out, see photo. The final steps of section one is the mating of all the sub-assemblies and the assembly of the wash out and the main gear and one-way bearing remembering to use the TT one-way clutch grease PV015. You might from the photos notice I left off the washers under each bolt/screw unless it was an adjustable piece, this further removes some weight. Next is the building of the head. This comprises of plastic blade grips and a metal centre hub and has new dampers, Innovation 3D ones. These are essentially two dampers in one, so a very hard one is inserted in a softer one so the you get progressive damping, a neat idea and after flying them I’m very impressed. The blade grips have the standard set-up with ballraces and open thrust races, remember to fit the larger hole to the inner most side of the head, remembering to grease these of course. The flybar is 5mm stainless and has 30g paddles. These are quite thick in aerofoil and have a large surface area, provide great stability in the hover and excellent cyclic response without destabilising the machine in fast forward flight. The mixing levers have the ability of 3D and extreme 3D, I set mine to extreme and decided I might as well see the maximum ability of the machine in 3D. There is an adjustable phase ring that you set up when you have the boom fitted. This is great as it means you can adjust out any unwanted mixing during 3D. The tail box is a very simple affair yet very powerful. The tail is driven by a torque tube that is not the easiest to install and they suggest you secure the bearing housing with a drop of goop, or Zap. This I did making sure not to get any near the bearings. Then it’s a matter of compressing them and feeding the torque assembly down the boom. I’ve not crashed it yet, so I don’t know how easy it is to get the assembly out again, perhaps cut the tube down with snips? We will see no doubt! The tail grips are plastic and have a pair of bearings in each. I chose to try some V-Blade tails and they rock! The boom is secured very well by clamping. The tail servo is rear mounted and has a direct rod to the tail slider. I’m intrigued as to why the tail boom supports join the main frame so high as apposed to the normal low position giving better triangulation and should result in a stiffer tail and be able to run more authority. I have a pair of the lower frame braces from G-Force on their way to me and the rear one has provision for bringing the boom supports down, so I will try and see if there is a noticeable difference. Servos come next and these are all push pull. 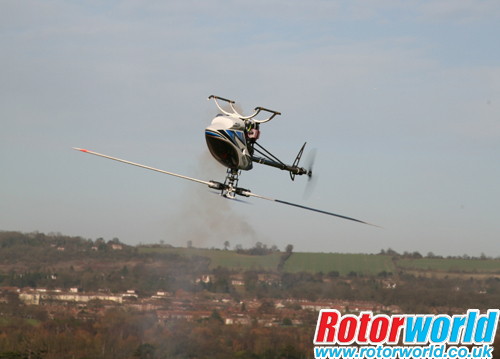 I chose JR DS8715 0.09 sec @ 60-degrees and 12kg/cm and I fitted a JR770 gyro with JR 8900 tail servo 0.05 second @ 60-degrees. There is actually a newer version of the 770 now with some changes to software, but I had a 770 and where as it takes a lot longer to get right than the new one when it is set up it takes some beating. The whole model was set up on a DX7 Spectrum radio that I reviewed last year and have flown ever since. The way to do it, is to plug the GV1’s signal wire into the AUX 2 channel on a Spektrum 7 channel receiver. Then, go into the ‘INPUT SELECT’ screen and set the AUX 2 channel to ‘F.MOD’. This means that the AUX 2 channel uses the 3 position flight mode switch to change signal, with one a minus value, one a middle value and the third a positive value. These are the values that the GV 1 uses to instigate the use of it’s internal three head speed settings. Most transmitters have the same facility to do this, that’s why Futaba have designed the GV1 and GY 701 governors to work in this way. After the above, it’s simply a case of placing the flight mode switch into the normal position, then setting the 1st head speed inside the GV1, Then place the flight modes switch into the idle 1 position and set the second head speed inside the GV1. The same with the 2nd Idle up position. Make sure that the ATV value for Aux 2 is set to 100% on both the minus and positive side. Also make sure that the AUX 2 channel has the sub-trim set to 0. Now the GV 1 will operate on three head speeds as per the settings inside the GV1 unit. The GY 701 governor operates in the exact same manner. For most Governors, if the Aux 2 channel inside the DX7’s INPUT SELECT screen is set to ‘INH’, then flight state programming (programme mix) can be used to set head speeds for all governors which use the ATV value to run governor head-speeds. The GV1 and GY 701 governors cannot do this unless the S-BUS system is used. The DX7 SE works in exactly the same manner as the standard DX7 in regard to all the above. Oh yes back to the model. The engine was popped in and trued up and a Hattorri exhaust was fitted. This is nicely engineered and is on silicone anti-vibration mounts. A Flightpower 1600mAh receiver pack was fitted with a power box regulator. Now I can hear you all expressing air. I know it’s a small LiPo, but I wanted low weight. This is for extreme 3D, so I will either charge after two flights or change to a second LiPo for further flights. I don’t understand the need to lug extra weight around and hopefully that’s a valid enough reason for my choice of a small power box digi switch regulator. This is good for five amps and am told will peak eight, so I’m trying it as I wanted to see what can be done on the weight saving issue. If I find this is getting very hot I shall change to the Gemini type that has greater power ability but is slightly larger. So far after 10 flights I have not had any issues, but as I get more and more stick banging we will see but it looks good so far. Setting up pitch angles. Mmm, I’m sure those that are experienced will agree that too much emphasis has been put on this in the past, using pitch gauges and the like. Stick bangers want the same both ways so get the 0-degrees pitch centre stick and mid-swash travel then max out each end, check max cyclic throws, then back off each accordingly until no binding in full neg and positive when spinning head by hand. Go out and fly it. If you need to pull a bit off as it’s bogging then electronically pull a bit off, tweak the motor, tweak cyclic, if you’re not up to this then ask a club guy that YOU know can fly to check the machine out. If you don’t have any of the aforementioned abilities, then Thunder Tiger has put a handy pitch guide in with the Raptor 90 and it is a guide on the frames themselves, but I personally would suggest you try to find someone accomplished to give it a flight or two. A word on this, as there is always the uneasy question of what happens if it goes in? Well in my world if I walk up to someone and ask for a go of their machine I take full responsibility for it, however if someone walks up to me and asks me to test something I will do all in my power to check the machine and fly it without damage, however there are those times of lock out or a new engine going quiet, most of the experienced guys will manage if they have radio control should manage an auto sometimes not pretty but defiantly damage limiting! Speaking of damage, Thunder Tiger has always been known for its very reasonable pricing structure and it won’t be a house selling operation on the day it does go in. Yep it will at some point and the sooner you accept it the more fun you’ll have. The YS91 is a beast of an engine. I wound out the needles as per the instruction book for initial starting and a few seconds later she was raring to go, however I was not impressed with the engine note at tickover through the Hattori, but as soon as it spooled up it changed into a lovely quiet one. I’m told by someone else they had noticed this on theirs, so the trick is getting it doing what it’s there for as soon as you can. So do I like the latest Raptor 90? Yep! It’s a great heli that lives up to everything expected.